Finding the right way to anchor and authentically express your brand is like setting off on a road-trip to an undetermined destination. No-one in the car has been there before, the road markings seem unfamiliar, but somehow, you’ll know it’s the right place when you find it. If that sounds nebulous, it’s because it is. It’s hard to build a brand that people believe in, and almost as hard to find authentic and helpful accounts of branding from the inside. That’s why we’re telling ours. In this article, we’re sharing the steps we took through our own eight-month brand exploration. In the first section we explain why we decided to explore our brand, and the second section is all about our journey - it's a retelling of the steps we took. This will give you an understanding of what a brand exploration can look like and possibly provide a template for your own. Let's go. Who we are: Jostle is an eight-year-old SaaS company that’s creating a new kind of intranet to help organizations improve internal communications, workplace culture, and employee engagement. We call it our People EngagementⓇ platform. We serve over 400 customers around the world from our 65-person office in Vancouver, Canada. Why we did this: This wasn’t a rebranding exercise in the typical sense as it wasn’t about our logo or visual identity. Rather, it was about finding a clear way to encapsulate and express who we are and why we’re different. This was the next step along our path of discovery and clarification for our growing brand. It's an evolving, ongoing investment rather than a one-off project. Key drivers: These are what motivated us to press on along our brand journey. We’re a brand-driven business that relies on new customers finding us in a very crowded market. We needed a more compelling way to attract interest and communicate why we’re different. We needed to stay away from buzz words to create something of substance. We had to uncover our unique attributes and then express those clearly. We know that our people lie at heart of our brand, making it important to connect and align the internal and external manifestations of our brand. We had to create a strong foundation from which to reinforce our workplace culture and express our external brand and reputation. Surpassing the 50-person company size meant attracting, retaining, and growing our employees was becoming more challenging. 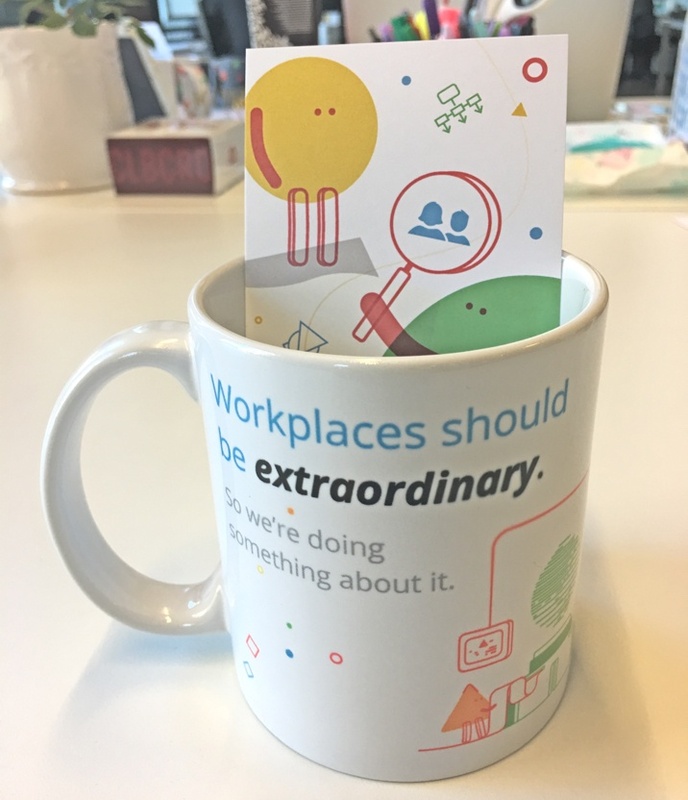 We wanted to clarify and articulate our unique workplace culture, where our people thrive and are doing the best work of their careers. Our people create our brand experience for our customers and other stakeholders. We needed to define what this experience is and then understand how to deliver it consistently across the myriad of employee roles and personalities that make up our team. Engage brand coach: We tapped into specialized experience and insights around brand development by engaging an external brand coach, Ben Garfinkel, to be part of our core team. He guided us when we strayed off course, helped us understand how ideas would look to outsiders, and helped align points of view. Outline goals: Our core team (our CEO, Marketing Director, and brand coach) met several times to develop the goals of our brand discovery project (see key drivers above). Understand ourselves: We started by looking at everything we knew to be true about ourselves. We discussed what had worked in the past, what was less successful, and what we had previously learned from our branding journey. We talked at length about what made our team and product unique. Develop positioning statements: After a few whiteboard sessions and a lot of questioning, testing, and adjusting, we collated these thoughts into a series of potential positioning statements based on four different themes: why we’re different; our purpose; how we help our customers; and how to be inspiring from the inside out. Reach out: We hosted a working session with a group of employees who represented a cross-section of our team. Large posters with each of the themes and their related positioning statements inspired conversation and critique. At the end of the session, participants voted for their favourite theme and statements with coloured stickers. Sanity check: After this session, all Jostlers were invited to view the posters, and share their thoughts by writing on the posters or engaging directly with the core team. Define brand attributes: After the workshop, the core team also began to define Jostle’s brand attributes. 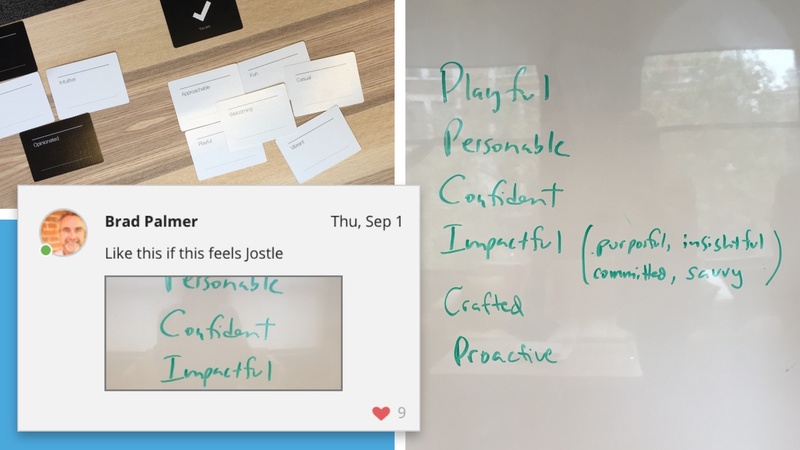 Our brand coach led a creative session to test which words and adjectives resonated with Jostle’s persona, including words that our customers use to describe us. 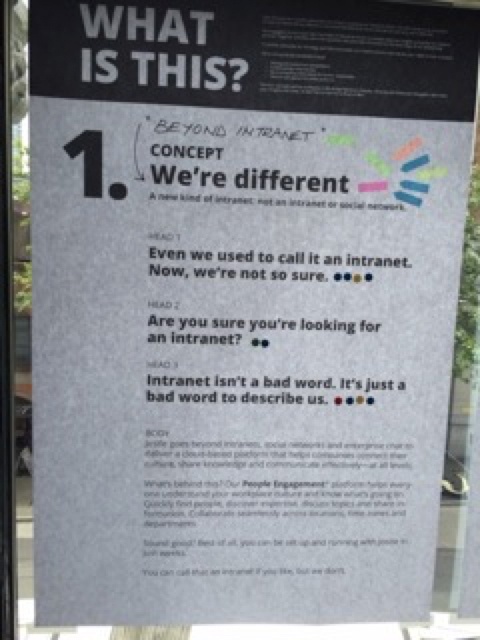 We created a list of words and shared it with all employees. Incorporating their feedback, we finalized five key brand attributes: engaging, confident, impactful, crafted, and celebratory. Analyze: The core team set about making sense of all the feedback received on the positioning statements. We developed a set of filters that were used to test every candidate to see if it was worthy and workable. For example, the entry statements had to be declarative, immediately comprehensible, and align with our brand attributes. Iterate: There were many iterations that delivered deeper analysis, greater clarity, and lively dialogue. We applied the filters fastidiously to uncover the flaws of every candidate. In fact, we rejected all the original concepts as we worked to find the best way to express how we deliver value to our customers in a way that was true to our character. Check in: Along the way, we checked in with key stakeholders such as our Executive Team and our marketing and design groups to test our ideas, as well as other Jostlers who expressed an interest and contributed varied perspectives. We also turned to strategic advisors such as Jostle board member Dr. Marla Gottschalk to further validate our thinking and provide an objective perspective. We began to build our brand language around the notion of “helping organizations become extraordinary by creating connected and vibrant workplaces”. This also gave us a strong call to action for each of us, as we strive to become extraordinary ourselves, and as a company. Write Brand Foundation: We then wrote a Brand Foundation document that encapsulates who we are, where we came from, why we’re different, outlined our brand attributes etc. It’s a reference guide and starting point for putting the new positioning into practice, both internally and externally. Present to stakeholders: We shared the final positioning with our Executive Team. After receiving their support, we met with our design and marketing teams to share the positioning and its key ideas. We also presented an update to our Board of Directors. Build new home page: With key stakeholders supporting our approach, we started building our new website home page. This is the anchor of our external brand presence and was our first test at putting the new brand messaging to work. 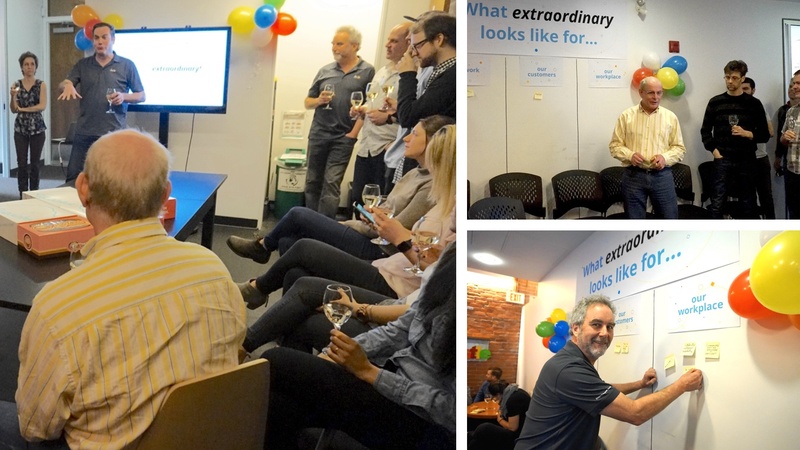 Launch positioning: We hosted a company-wide meeting to introduce and celebrate the new home page going live. We emphasized the duality of the positioning and its importance to us and our customers (both current and prospective). The new home page launch aligned with, and was central to, this internal celebration. Understand what “extraordinary” means to us: The purpose of the celebration event was twofold. First, it was to introduce the new “Become extraordinary” positioning. Second, it was to kick-off an exploration into what extraordinary means to Jostle—for individuals and their work, for our customers, and for our workplace. We did this by inviting all Jostlers to share their ideas with us via sticky notes on the wall of our kitchen. This was a very public and inclusive way to gather thoughts and opinions. Knowing that leading by example is an important part of building an authentic brand, we asked leaders to be active participants in this exercise. Assemble a Brand Taskforce: Once we consolidated all the ideas generated through the sticky note exercise, we needed to understand and refine the ideas into concepts that reflected our brand internally as a team of people sharing a strong workplace culture. Eight employee volunteers, our CEO, and Marketing Director formed a Brand Taskforce to help us achieve this. What followed was a couple of months of exploration and debate as we worked to evolve the granular sticky notes into a cohesive set of statements. Declare who we are: After this important (and unifying) stretch of work, we honed a new Jostle Declaration to set out what we care about and what we believe in as individuals and as a team. The Declaration gives us a way to check ourselves and stay true to our character and promises as we rapidly grow. And it’s a way for others to understand what we’re about and what’s important to us. Without a doubt. We fully believe that great brands reflect what’s inside. And we know that every minute and cent we invest in understanding our brand and how our people demonstrate and express it, is well spent. We’re now onto the next phase of our journey—living and breathing our Jostle Declaration and demonstrating what an extraordinary workplace looks like. We’re already seeing the immense benefits of a clear brand declaration, and look forward to seeing more unfold in the future as we continue to work at it, every day. Although all brand journeys are a little different, we hope our story has given you an insight into the steps we took and the outcomes we're enjoying. We like honest brands and we want more of them in the world. If you’re considering your own brand exploration and would like to touch base, please reach out to us. We’d be happy to chat.